Of the many landmark innovations KEF has pioneered, arguably the greatest of all is the Uni-Q® point source driver array, with its outstanding acoustic clarity and off-axis dispersion. With over twenty years of continuous innovation and development the Uni-Q® driver array achieves a level of sound quality over a broad area simply not achieved from conventional speakers. With Uni-Q®, sounds come at you so naturally that it seems as if the musicians or actors are actually there in front of you. Whether you are in the centre of the room or off to one side, recordings sound uncannily real and utterly convincing. Uni-Q® achieves this because, unlike conventional speakers, the sound that is critical to the experience comes from the same point in space, and is produced in a controlled and continuous way over the whole audio range. It is not easy to produce a convincing and realistic illusion of a live performance because the sound from a high quality loudspeaker does not come from a single source, or drive unit. Two or more units are required to faithfully reproduce the entire audio spectrum from the low bass produced by a concert organ or a cinema explosion, to the delicate nuances of the human voice in the midrange right up to the shimmering treble of cymbals. Most loudspeakers have the midrange and treble drive units mounted one above the other, so the sound is coming from two different places, causing audio 'confusion' and losing the chance of achieving a truly natural sound. With Uni-Q, the midrange and treble units are mounted at precisely the same point in space - allowing them to integrate perfectly and create the ideal sound field for the listener to experience a convincingly natural sound. It has been well known for many years in the audio industry that one of the ideal forms for a loudspeaker is the 'point source' - where all the sound is radiated from the same point in space. To do this, the drive units (for example, the bass and treble units in a two-way system) need to be mounted so that their acoustic centres are at the same place. The problem in achieving this was the sheer physical size of the treble unit, which prevented it from fitting in the centre of the bass unit. Various forms of co-axial units emerged where the tweeter was mounted either in front of or behind the acoustic centre of the bass unit but these have significant drawbacks. The key to the invention of Uni-Q was the arrival on the market of a new magnetic material called Neodymium-Iron-Boron, which has ten times the magnetic strength of a conventional ferrite magnet. This material allowed a high sensitivity treble unit to be made small enough to fit within the voice coil diameter of a typical bass unit and so be placed at the precise point where the acoustic sources are 'coincident'. With the acoustic centres at the same point in space the acoustic outputs of the bass and treble units are 'time-aligned' in all directions allowing the designer to achieve perfect integration between the units not just on one axis, as is the situation with vertically separated units, but in all directions. The first advantage of Uni-Q, therefore, is the lack of the vertical interference pattern of separated bass and treble units, which restricts the region of high quality sound output to only +/- 10 degrees above and below the principle axis. 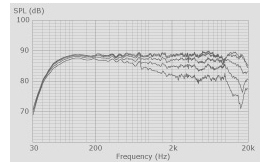 This same effect not only limits the vertical listening area but also produces a dip in the total energy output in the bass/treble crossover region, causing a distortion of the reverberant energy in the listening room. In Uni-Q systems this effect is completely eliminated. The second advantage of Uni-Q is what we call 'matched directivity'. With the treble unit mounted at the centre of the bass driver's cone, its directivity (the spread of sound away from the main axis) is governed by the angle of the cone, which also largely determines the directivity of the bass driver. So with the coincident mounting of the two units, the directivity of the treble unit is adjusted to be virtually the same as that of the bass driver. 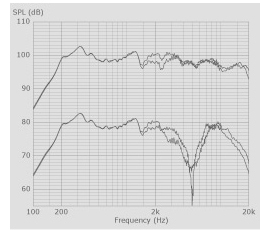 As a listener moves away from the main axis, the output of the treble unit falls off at approximately the same rate as that of the bass unit, thus improving the uniformity of tonal balance across the listening area, and improving the off-axis stereo imaging. The listener is not, therefore, as limited to a central 'sweet-spot' as with conventional speakers. And, of course, the same is also happening in the vertical plane, so the reverberant energy in the listening room maintains an even balance, adding realistic ambience to the sound without introducing tonal colorations. The directivity is often referred to in engineering terms as the 'Q', and the 'Unifying' of the 'Q' gives rise to the name 'Uni-Q'. From a listener's perspective, the combination of the matched directivity and precise time alignment in all directions gives significantly improved stereo imaging over a wide listening area, the realism of which is enhanced by the even balance of the reverberant energy within the listening room.